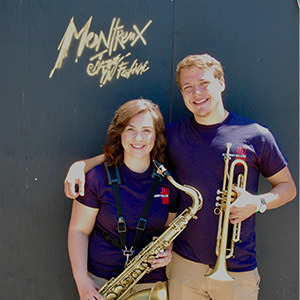 For tenor saxophonist Gabby Bandera ’19, the highlight of the Elmhurst College Jazz Band’s summer tour was the Umbria Jazz Festival in Perugia, Italy. There the 20-member ensemble performed with guest conductor Ryan Truesdell, a star composer and arranger, and Jazz master Dee Dee Bridgewater. The band also performed at the Montreux Jazz Festival in Montreux, Switzerland; the Vienne Jazz Festival near Lyon, France; and other smaller venues. It was the second European tour for Bandera, a major in saxophone performance and music education from Oak Lawn, Illinois. “It was cool to explore new locations and revisit old ones,” she said. Bandera began playing clarinet in fourth grade and sax in middle school. Professionally, she plans to teach younger students and continue performing. For trumpeter Adam Roebuck, the trip was bittersweet since he recently graduated. Roebuck, a major in jazz studies and music business from Columbia, Missouri, started trumpet in the sixth grade. He plans to teach as well as write and perform his own music.